Temporary immersion systems (TIS) are among the best options for commercial micropropagation. However, although successes have been reported with TIS, it is necessary to establish the most suitable system. The aim of this research was to compare the efficiency of different banana (Musa AAA cv. Grand Naine) micropropagation systems. In addition, a liquid medium with partial immersion and a semi-solid culture medium were evaluated. At 28 d of culture, the number and length of shoots, number of leaves per shoot, chlorophyll content, stomatal index, and the percentage of closed stomata were recorded. 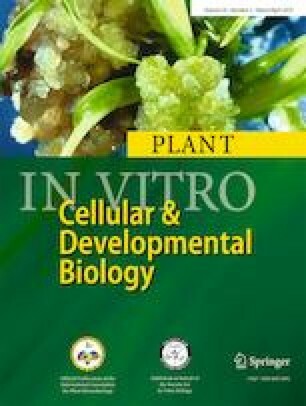 Additionally, the survival percentage and ex vitro development of the plantlets were evaluated during acclimatization. Results showed that TIS have a higher multiplication rate with respect to partial immersion and semi-solid medium. The chlorophyll content, stomatal index, and stomata functioning were affected by the different culture systems. The different culture systems had no effect on the survival percentage, although morphological differences were observed during acclimatization. The SETIS™ bioreactor was more efficient and resulted in better development in the plants obtained in vitro and ex vitro, which proved this system to be a useful alternative for banana micropropagation. The CONACYT-Colegio de Postgraduados-Campus Córdoba financially supported the study.